It is always so exciting to see what God will do each time we visit the hospital. We always pray for the guidance of the Holy Spirit as we prepare and God just does special things. 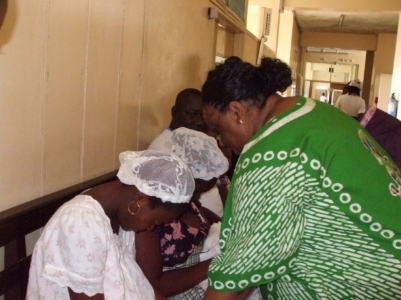 Our 2007 trip to Korle Bu Maternity Hospital gave us yet another victory. I believe God is using us as a ministry to bring more and more changes in the lives of the mothers and the hospital. 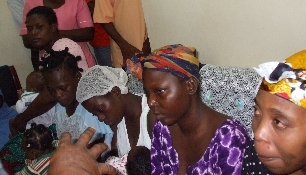 Seven mothers and six babies were redeemed on this trip. “Still Births” are yet a problem in Africa. This could be for the lack of a lot of things, pre-natal care being number one. If one of our readers or partners would like to sow into the beautification of the Delivery Room, just go to the Resources page and submit your information. Most of the ladies that are in the maternity block, do not get the opportunity to see the beauty that could be in the hospital - a little fresh paint, some bright wall tile, some new tile floors, a little cheerful wallpaper, etc.,etc. Think about it! On this trip, we had a scenario where each mother and child that were redeemed (bills paid) had been in the hospital for one hundred plus days each. One woman in particular, who had lost her baby, had been there for 218 days. The Word of God tells us that God can not forget us, because our faces are graven in the palm of His hand. There was not a dry eye in the room as these women were told that their bills were paid and that they would be going home that day. One woman even lived in Volta regions - at least a whole day's journey. The team provided money for transportation and prayer. The team also visited one of the floors on the maternity block and gave gifts to the mothers and their babies as well as prayed for each. Additional text updates will follow shortly. View photos from the 2007 trip below. And, photos of the team ministering in the hospital. Woman, who lost her baby, was in hospital for 218 days, now going home! One of the seven women and her baby whose bill was paid is now being prayed for. 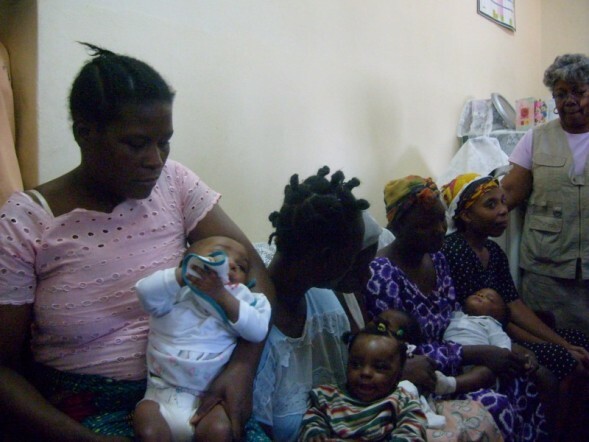 Women with babies who are going home. 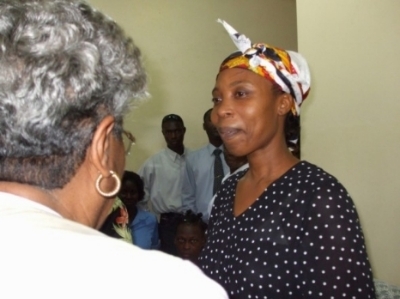 Five of the seven women whose bills were paid are now being told they are going home! Woman elated about bill being paid and going home! 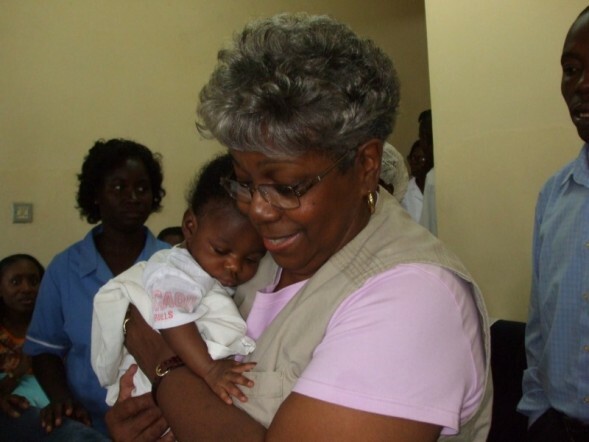 Apostle Charlene holding one of the six babies. The “Redemption Project” is worth your support. 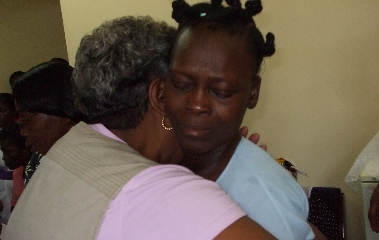 We redeemed another seven(7) mothers this trip at the cost of nearly four (4) thousand dollars. 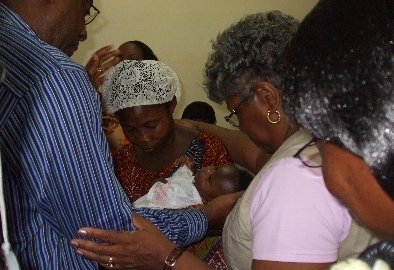 Following are photos of the team ministering in the hospital. Want to know more about the “Redemption Project” and how you can help, go to the Resources page and send your information to us. We will respond shortly.